Over 5,000 fishermen from various hamlets in the district on Thursday commenced on an indefinite strike protesting the arrest of their fellow fishermen belonging to Akkaraipettai off Kodiakarai coast by the Sri Lankan navy. "The fishermen will not put out to sea until a concrete solution is found to the problem of indiscriminate attack and arrests by the Lankan navy by the Central and state governments", Akkaraipettai fishermen association leader Manoharan said. Those engaged in fish processing and marketing were also taking part in the strike, he said. The fishermen who set out in nine boats were arrested by the Lankan Navy for allegedly violating the International maritime boundary line. 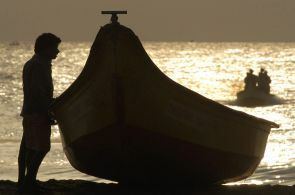 Five other fishermen from the district were injured in a mid-sea attack allegedly by their counterparts in Sri Lanka off Kodiakarai coast on Tuesday. Aren't our daily problems not newsworthy anymore?